The extraordinary success of Rubens as a painter in his native Flanders, as well as in France, England and Spain, enabled him to secure and train some of the most talented engravers of the day to reproduce his designs. He effectively fostered a school of specialist engravers dedicated to the propagation of the ‘Rubens style’. He was shrewdly attuned to the benefits that could be garnered from printmaking: obviously financial, but also as a means of publicising his pictures and promoting his reputation and influence. In this respect he was following an established tradition of collaboration between painter and printmaker, such as had existed in the previous century between Raphael and Marcantonio Raimondi or Cornelis Cort and Titian. to the professionals to be translated into the language of print. Rubens kept a watchful eye over the production and ensured his exacting standards were met by correcting trial proofs in his own hand with black ink or by retouching them with bodycolour highlights. The corrected proofs were then handed back to the engraver who reworked the plate accordingly. Whereas Rubens engaged numerous line engravers (engraving being the technique best suited to approximating the effects of texture and light in his paintings), only one woodcutter, Christoffel Jegher, was employed to work in his studio. Jegher was a book illustrator with the renowned Antwerp publishing house, the Plantin Press, from 1625 to c1643. It was during the middle part of this period that he collaborated with Rubens, producing under the latter’s supervision nine large woodcuts (all undated) between 1633 and about 1636. Woodcuts, while far less expressive of the qualities of oil paint than engravings, are nonetheless eminently suitable for emulating the bold lines of a drawing. Thus, Jegher’s immediate models were all drawings rather than paintings. The inscription on the Gallery’s woodcut specifies that Rubens drew the composition (P. P. Rub. delin.) rather than painted it (pinxit) or, more vaguely, designed it (invenit). Jegher’s name also appears on the print, recording his responsibility as the engraver (sculpsit) or, more accurately, cutter, of the woodblock. Its position well below Rubens’s name and the privilege (an early form of copyright) marks the division of roles and the respective status of the two collaborators on this print. The assurance of Jegher’s carving and his ability to cut long, broadly flowing lines on an imposing scale brilliantly conveys the figural grandeur and Baroque motions of Rubens’s prototype. The drawing that Jegher worked from was lost or destroyed, however there exists in the Louvre in Paris another drawing related to the print (not by Rubens’s hand) showing the figural group and the fountain. This sheet in turn repeats an earlier painted composition by Rubens, now lost, of which an anonymous copy exists in the Hermitage, St Petersburg. The story of Susanna and the elders is an apocryphal addition to the Old Testament Book of Daniel (13:1–64). While bathing in her garden, the beautiful Susanna is accosted by two elders who have lusted after her for some time. They emerge from a hiding place and demand that she sleep with them lest they accuse her of committing adultery with a young man. Susanna rejects them and her cries force them to take flight. 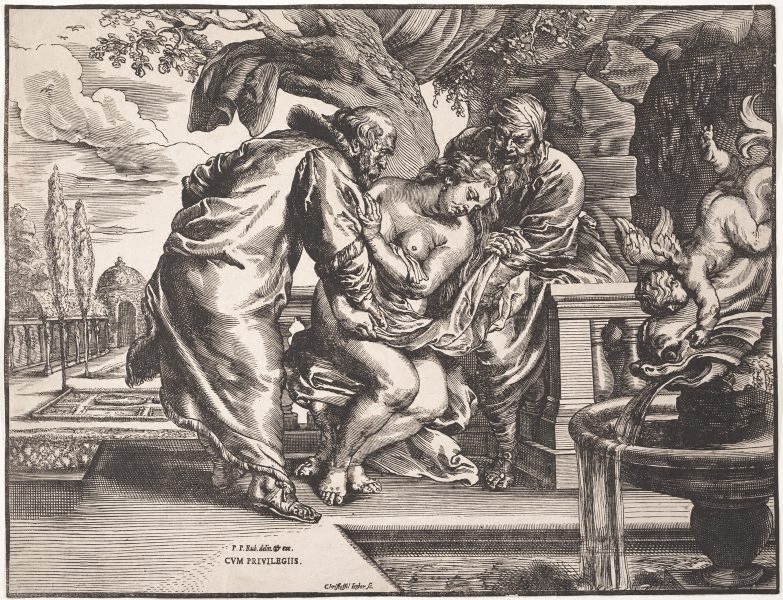 She is later condemned to death on the false testimony of the elders, but the young Daniel intervenes in time and exposes the two men as liars, whereupon they are stoned to death. The story of Susanna and the elders was often depicted in art, however its underlying themes – divine justice and the defence of innocence – eventually became less important than the pretext the subject offered for portraying the sensuality of the female body. Peter Raissis, Look , 'Early European works on paper', pg.20-23, Sydney, Aug 2014, illus p 22. Prints & drawings Europe 1500-1900 , Sydney, 2014, p 54, col illus p 55.